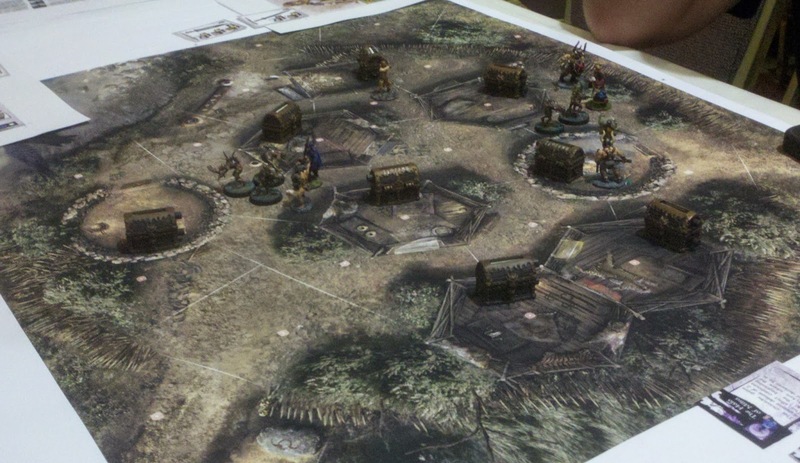 I attended our local convention over the weekend, and both ran and played in some fun games. 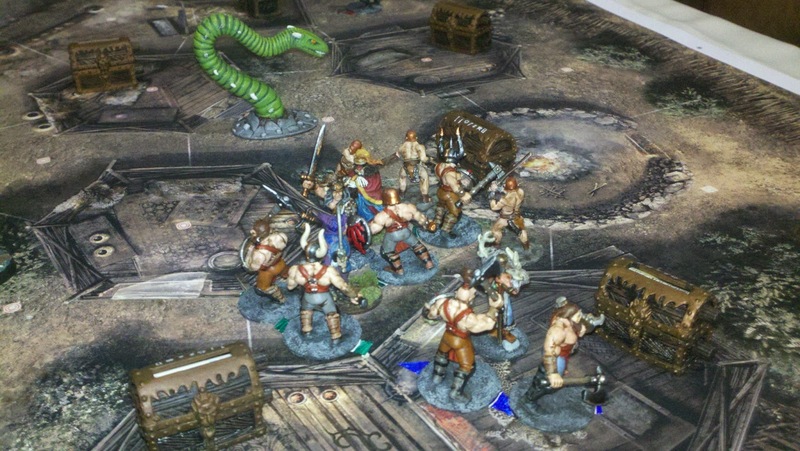 I ran a print & play version of the Conan boardgame from the very successful Kickstarter. Both games went very well. 2 people showed up for each game, & they each played 2 heroes. Conan is similar to Fantasy Flight Games' Descent dungeon crawl, in that it uses an active GM (or Overlord) who runs the heroes' opponents, and tries to win the game themselves. A number of interesting mechanics, like an minion activation track, limits the actions of the Overlord to prevent them from quickly swamping the heroes with too many minions. The scenario played was the classic "rescue the princess from the [insert evil-doers here] before she's sacrificed." This time the evil-doers were the Picts from the Hyborian world. The heroes were supposed to enter a Pict village, search the huts for the princess, & kill & bring back the head of the Shaman leader, all before a large Pict hunting party returns and they'd be overwhelmed (8 turns). For the 1st game, I misread the Overlord set up, and didn't give myself enough activation points, reducing my available minion options by about 30%. So the heroes ended up winning relatively quickly. 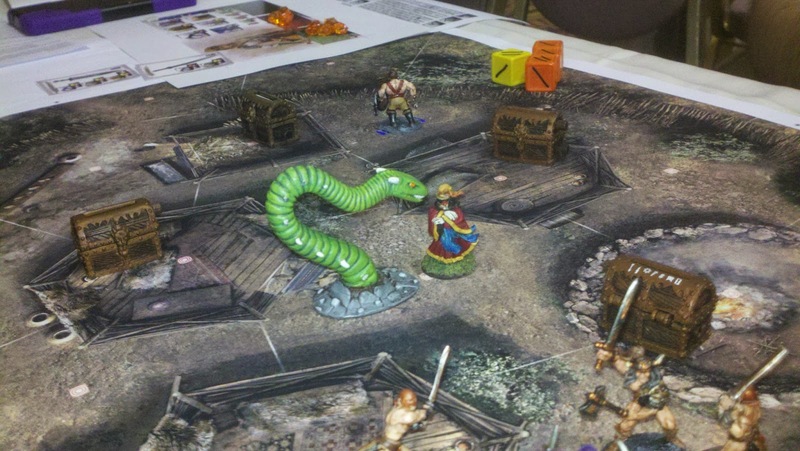 They pretty much wiped out anything that moved, including both the Giant Snake and the Shaman, by the end of turn 4. I got the number of activation points correct in the 2nd game, making for a definite nail biter. The players came up with the plan to allow lots of minions to gang up on Conan. 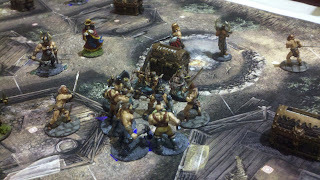 Then the magic user hero cast a fireball on Conan's location as a way to kill off most of Conan's attackers, knowing that Conan would be able to survive. Unfortunately, after doing this twice, Conan was seriously depleted. And he was made into a quick lunch for the Giant Snake once it showed up. The heroes finally found the princess they were trying to rescue and were trying to play a retreat from the village. But the evil magic user quickly fireballed the rescue party, killing the princess, & thereby preventing the heroes from completing their main objective. Both sets of players said they really enjoyed the game & unique mechanics & would be looking into it once it was released. For myself, I greatly enjoyed it to. It's always fun to run a game as a GM, and see how the scenario you've designed turns out. But being given the ability as the Overlord to direct the heroes' opponents, and getting to roll dice yourself, makes it all the more fun.